I’m having such a great time playing this. I was so excited when it first got announced at our Ubi presser during E3 — and was even more ecstatic to see Miyamoto join Yves on stage (and I even had a chance to tell Yves just that). 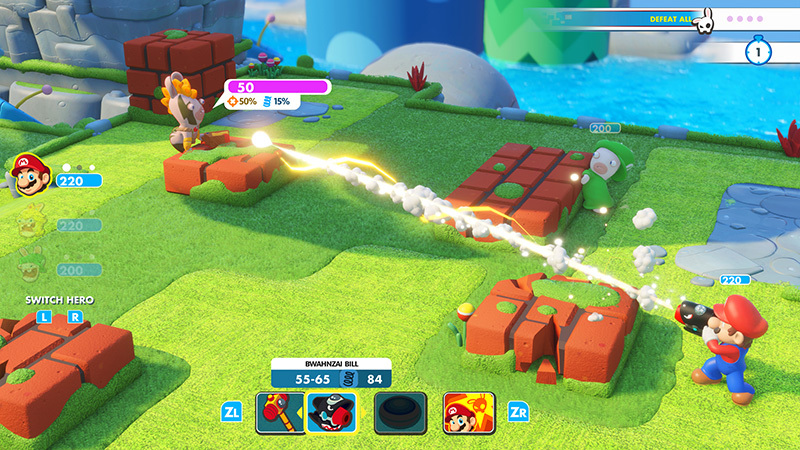 So yeah, I’m super happy that Ubi has produced a Mario game, and I’m even happier (and relieved) that it’s a fantastic game. I’m not even that big into turn-based strategy games — I like them fine, but don’t seek them out — but I was easily sucked into Battle Kingdom as soon as I started playing (I played 4-5 straight hours the first time I popped it in). A few days later, I’m still having a blast playing it, and it makes me hope that we’ll see more great collaborations between Ubi and Nintendo in the future.